Robert L. Crippen (Captain, USN, retired) is currently retired. He was previously President of Thiokol Propulsion where he served from December, 1996 to April, 2001. Thiokol produces the Space Shuttle Reusable Solid Rocket Motors and other defense and commercial solid rocket motors. Prior to joining Thiokol, he served as a Vice President with Lockheed Martin Information Systems in Orlando, Florida from April, 1995 to November, 1996. Crippen served as the director of NASA’s John F. Kennedy Space Center from January 1992 to January 1995. In this position he was responsible for all activities occurring on the U. S.’s gateway to the universe. During his tenure, the center processed, safely launched, and recovered 22 Space Shuttle Missions. He provided leadership for over thirteen thousand civil service and contractor personnel. This included oversight of multiple contracts supporting center operations for both manned and unmanned spaceflight. He also implemented cost savings of greater than 25% by establishing and developing new quality management techniques while ensuring the highest safety standards in an extremely hazardous environment. From January 1990 to January 1992 he served as Director, Space Shuttle, at NASA Headquarters in Washington, D.C. In this headquarters post he was responsible for the overall Shuttle program requirements, performance, and total program control, including budget, schedule and program content. He was stationed at KSC from July l987 to December 1989, serving as Deputy Director Shuttle Operations for NASA Headquarters. He was responsible for final Shuttle preparation, mission execution and return of the orbiter to KSC following landings at Edwards Air Force Base, California. Born September 11, 1937, in Beaumont, Texas, Crippen received a bachelor of science degree in aerospace engineering from the University of Texas in 1960. He was commissioned through the U.S. Navy’s Aviation Officer Program. As a Navy pilot from June 1962 to November 1964, he completed a tour of duty aboard the aircraft carrier USS Independence flying A4s in VA-72. He later attended the USAF Aerospace Research Pilot School at Edwards Air Force Base, California. Upon graduation he remained at Edwards as an instructor until his selection for the USAF Manned Orbiting Laboratory (MOL) Program in October 1966. Crippen became a NASA astronaut in September 1969. He was a member of the astronaut support crew for the Skylab 2, 3, and 4 missions and for the Apollo-Soyuz Test Project mission. 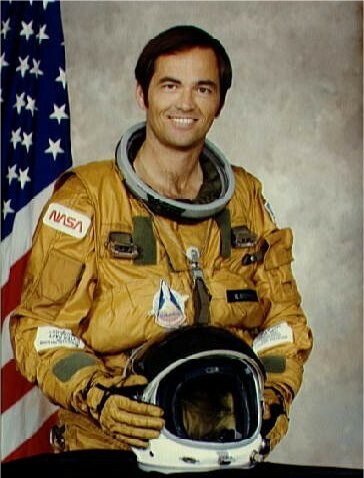 He was the pilot of the first orbital test flight of the Shuttle program (STS-1, April 12-14, 1981) and was the commander of three additional shuttle flights: STS-7, June 18-24, 1983; STS-41C, April 6-13, 1984; and STS-41G, October 6-13, 1984. His accomplishments have earned him many notable awards: inducted into the Aerospace Walk of Honor and the SETP’s J. H. Doolittle Award in 2007, the Congressional Space Medal of Honor in 2006, the NASA Exceptional Service Medal in 1972; five awards in 1981, including the Department of Defense Distinguished Service Medal, The American Astronautical Society of Flight Achievement Award, The National Geographic Society’s Gardiner Greene Hubbard Medal, the Collier Trophy and SETP’s Iven Kincheloe Trophy. In 1982 he won the FAA’s Award for Distinguished Service, the Goddard Memorial Trophy and the Harmon Trophy. In 1984 he received the U.S. Navy Distinguished Flying Cross, the Defense Meritorious Service Medal and the Defense Superior Service Medal. He also received NASA’s Outstanding Leadership Medal in 1988 and three Distinguished Service Medals in 1985, 1988, and 1993. He is also an Honorary Fellow and past President of the American Institute of Aeronautics and Astronautics and a Fellow of the American Astronautical Society and Society of Experimental Test Pilots. He was inducted into the U.S. Astronaut Hall of Fame on November 10, 2001 and currently serves on the Astronaut Scholarship Foundation Board of Directors.